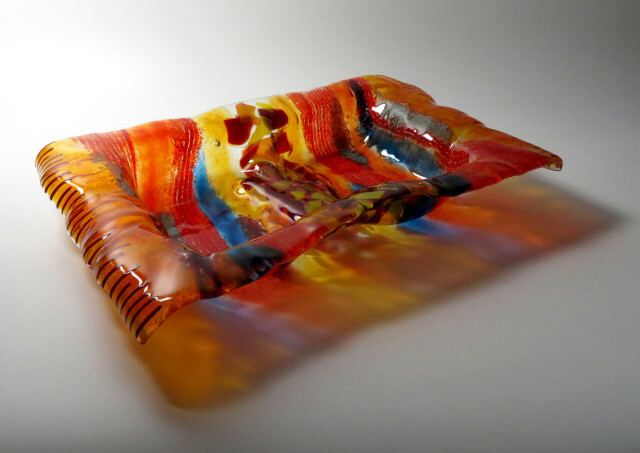 She creates both sculptural and functional pieces using several different methods, from fused glass through kiln and sand cast glass. Her freestanding sculptures – sometimes likened to paintings in glass- are often figurative, offering the viewer a frozen moment of animation. She also creates torsos and figures that give a glimpse of the human form that is simultaneously mysterious and revealing. Teresa uses colour in a dynamic and expressive way to infuse even simple pieces such as plates and bowls with a joy and vitality that makes her work instantly accessible. As a former knitwear designer, her intrinsic understanding of how colour, texture and movement interact permeates her glass work, making the solid seem fluid and the static kinetic. Although working primarily in glass, she also creates work in ceramics and mixed media, knitting together different media in a way that seems effortless. Her work is universally admired and instantly covetable; anyone can own a piece of her work and take joy from it every day. Teresa says of her work ‘My ideas come from the heart and emotions, from dance and movement, ancient art and archaeology, spirituality and the soul. Usually the ideas come first and the media second so sometimes I mix different materials in one piece e.g. porcelain with glass, giving it the solidity of reality and emphasising the ephemeral transparency of the unseen soul’.